Today I've had the pleasure of working on a small side project at the office. As many others, I highly enjoy traveling, which often includes stepping onto an airplane. With that thought in mind, I decided to investigate the possibilities of air travel. To begin with I gathered 3 datasources with different information about air travel - All from openflights.org, a website with various information about commercial and private aviation. This merely being a side project I limited my scope to focus on routes, at least for now. Where can we go, and from where? The first contained information about which routes are flown, where to and where from. 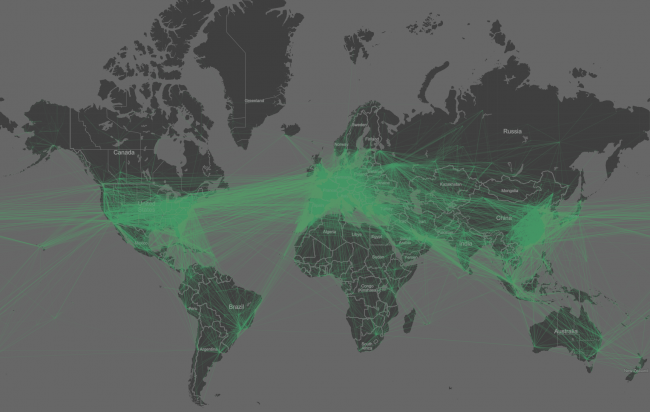 The second contained geocoding for airports, this information was in particular important as it would enable the use of visualising the data on a map. The last dataset held details regarding airlines. With this trinity of data, I fired up Alteryx, made the appropriate joins and arranged the data in a manor which would suit the later purposes in Tableau. At this point the preparations were done, and the data exploration could begin. Often when working with a new dataset, I spend a bit of time slicing and dicing the data in different ways to get a feel of any patterns that could be interesting to investigate further. Firstly I looked into the patterns of domestic aviation. I won't be the judge of whether or not the results are surprising. The high amount of domestic aviation in The United States were probably foreseeable, but the amount of connections throughout China somehow at least surprised me. Naturally the second step was to explore the patterns of international flight, which in Tableau of course was no hassle at all. I simply removed country from the level of detail and the visualisation changed into the map below. A project for another day will be to extend the visualisation with some dynamic features, data about pricing and most frequently used routes.